I’ve always had a slight obsession with galaxy prints and images of constellations… Basically anything celestial. It probably has something to do with my early teenage fascination with astrology and the supernatural. And that astronomy class I took in college. And that John Cusack movie where he romantically points out the constellation Cassiopeia. Whatever it was, it’s not going away anytime soon. Which is why when I first heard of Slow Factory, my mind was blown. 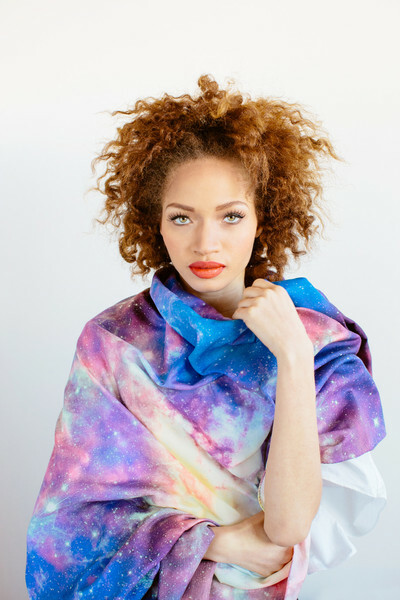 Slow Factory is a company based in Brooklyn, which uses open data satellite images from NASA and prints them onto scarves. They have several beautiful nebulas, as well as new collections, which are emblazoned with images of Mars and cities by night from up above. Most recently, they have sweatshirts featuring Le Petit Prince on the Comet. They use both silk and silk-cotton blends and all scarves are made in Italy. To top it off, they include in their mission to support human rights and partner with NGOs. They’re doing things right every step of the way. I received my scarf a few weeks ago and I couldn’t be happier! I wish it weren’t so cold out so that I could wear it already. For now, I’ll just wear it around the house. The top image is a watercolour illustration that I made inspired by the galaxy scarf I purchased. The photo of the model wearing the scarf is via the company’s website. You can have a look at their collections here.